For whatever reason, I have become quietly obsessed with the quickest four-cylinder drag car in the world, Jett Racing’s Mitsubishi Eclipse that runs 110 pounds of boost through a compound twin-turbo setup, producing about 500 horsepower per cylinder. It’s sometimes explode-ey, but fascinating. It is rear-wheel drive, and the quickest four-cylinder in the world with a 6.20 at 229 mph pass under its belt. The car sits somewhere around the 2,000 HP mark, give or take a couple hundred, and it runs a compound turbo set up, like you find on diesel drag machines. It’s hard for me to exactly describe what I find so interesting about this thing. I am not a drag racer. 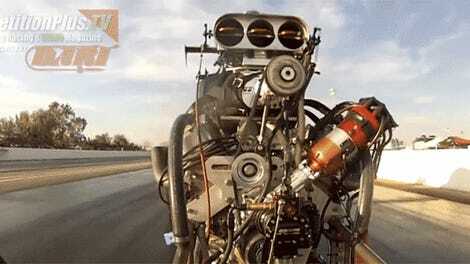 I will never go this fast, or build a car this powerful. The engineering involved in this build is in just about no way relevant to my carbureted old car. But there is something intriguing about listening to owner Collin Willshire explain how he was maxing out the efficiency of a single turbo, though it had been making as much power as it is now. Boosting the engine first through one turbo and then from there through another didn’t give them outwardly any more boost, just got it at a lower temperature. And it’s a joy to listen to them debate the merits of billet engine block, but one that is made to mirror the exact dimensions of the legendary 4G63 engine that came out of the factory from Mitsubishi. It’s virtually entirely custom, but Willshire talks about a satisfaction that he could swap these parts into his truck if he wanted to. The semantics of everything is so granular. In any case, this makes for an interesting watch, if only to see the gears turning inside the brain of one of the world’s top drag teams in this discipline.